WHY SHOULD WE MOVE TO THE CLOUD? Companies across the globe are shifting their software and systems to the cloud. This was illustrated in dramatic fashion by Dell’s 2015 Global Technology Adoption Index. According to their research, 82% of companies globally are already using cloud-based technologies. Most of those not making the move yet list data security as their chief barrier. But a combination of technology, education and – of course – change management can overcome that obstacle. In fact, in a 2017 survey by CITO Research and Commvault, 75% of IT executives said that data protection and backup were among their most impactful cloud projects. That same study showed that 93% of those companies have moved or are planning to move at least some of their processes to the cloud. The truly staggering number, however, was that 56% of those IT leaders were planning to move not just some, but all of their processes to the cloud. 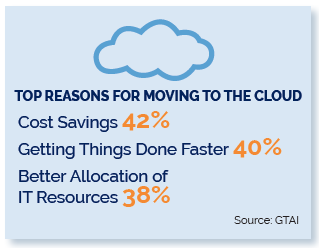 The reasons for moving to the cloud are well documented. Cost savings, getting things done faster, and better allocation of IT resources are the most common. But Dell’s study also added a compelling new reason to the mix: companies using cloud technologies experienced between 46% and 51% higher growth rates than those who didn’t. Reasons like these explain why 81% of the Commvault respondents admitted that “fear of missing out on new cloud advancements” was one of their driving factors. So where do these companies start their cloud migrations? Email, office and communications software, database access (like CRM), disaster recovery, and human resources (HR) are a few of the most common strategic cloud initiatives. Others are driven to the cloud first by market forces, such as mobile commerce and supply chains. Wherever they start, as organizations become more comfortable in the cloud, other systems and applications inevitably follow. 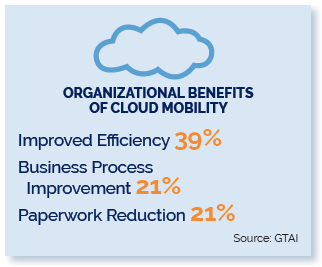 As for your employees, moving to the cloud is an exciting event. They’re already familiar with Google...adopting applications and services from the Google Cloud is not a difficult sell. Your entire organization will feel like they’re being upgraded. Your change management program will build on that enthusiasm – and show them why it’s a great business decision, too. Migrating to the cloud is not “easy” by any stretch. You must weigh factors such as time, cost, security, and satisfaction when planning your migration. A solid plan that accounts for each of these factors invariably yields better results. By the same token, lacking a coherent plan heightens the risks, which has kept some organizations out of the cloud despite its many advantages. It doesn’t help that some of the systems which lend themselves best to cloud computing – email, calendaring, file storage, and office applications, to name a few – are not small specialty systems, but systems used by everyone in your organization. Some of the systems which lend themselves best to cloud computing are not small specialty systems, but systems used by everyone in your organization. Replacing these systems can cause a lot of upheaval and confusion...which in turn, can cripple your productivity in that time frame. Poor planning and communications will turn that confusion into resentment, reducing both user acceptance and satisfaction. Resistance to the new systems can even lead to problems in your legal and compliance offices, compounding the issues of a poorly launched system. In this manner, your entire cloud strategy could be dead on arrival...and the ROI you expected becomes far out of reach. The answer to all these issues, of course, is a well-designed change management process. With such a change management process in place, you can smooth your cloud transition, educate your employees, and minimize the threats from all challenges, including resistance and legal non-compliance. Don’t think you need change management for that? Think again. Gartner estimates that by 2020, 95% of all cloud security failures will be the customer’s fault. These errors will end up costing millions of dollars in time and money – time and money that a good change management program could help you avoid. Sometimes you need to make an investment before you can earn a reward. Change management is like that. Investing in a formal user adoption process as part of your cloud transition can have a huge impact on your ROI. A common example of this can be seen in organizations migrating from Outlook to Gmail. Without a user adoption program, most new Gmail users will try to use Gmail the same way they were using Outlook. They’ll create tags and labels just like before – and they’ll be wasting a ton of time. A user adoption program could show them that Gmail’s advanced search capabilities makes tagging unnecessary. Instead, they’d learn how to use Gmail’s powerful features to spend less time organizing their email and more time contributing value to the company. Productivity can make all the difference in your organization's success. 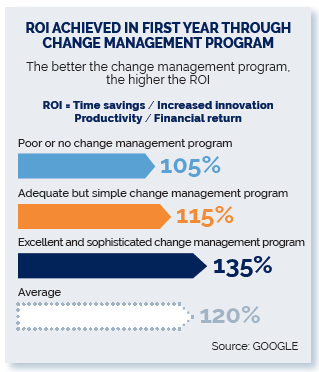 Google’s research into change management programs presented some startling results. Even a poor change management program provided 105% ROI when migrating users to the cloud. And while a full-service, best-in-class change management program might be pricier, the expense was more than offset by a 135% return. Want more proof? Projects with excellent change management programs are six times more likely to achieve or exceed their goals. And firms with highly effective change management activities are three-and-a-half times more likely to outperform their industry peers financially. Sure, you can make that transition to the cloud alone, or without a user adoption strategy. But why would you want to, when investing in change management clearly produces so much more value for the effort? While the main purpose of a change management process is to prepare your end-users for change, success actually starts at the other end – the top. When asked about the most important factors in successful change management programs, 84% of companies reported executive leadership as one of their top three. The influence of executive leadership is shown to translate directly to the front line, where it was seen as the #1 factor in achieving higher levels of employee engagement and buy-in. The next two highest influencers were increasing consultations with front-line employees and better communications. 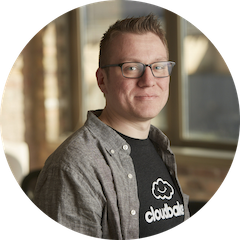 The top three factors noted above drive the Cloudbakers’ change management process. So how do we use them to lay the groundwork for a successful cloud transition? What communications systems are currently in use? What systems should be replaced? What are the budget, timetable, and rollout constraints? How have employees been trained before? What’s worked and what hasn’t? What segments and user groups are present and how does their usage differ? What’s the geographic distribution of employees and how will they be reached? In addition, we conduct our own surveys and interviews to gather more front-line / end-user data. And rather than blindly accepting everything we hear, we’ll run data analyses to confirm as much of the qualitative data gathered as we can. The point of discovery is to find out who is involved and what needs to happen for the transition to be successful. Identifying your executive sponsors, change champions, project leaders, and other influencers is the next phase of preparation. These are the people who will set the tone for the rest of your staff. Their involvement and positive influence will be key factors in your overall success. While some companies name one or two executive sponsors and drop all the responsibility on their shoulders, the best practice is just the opposite. Executive sponsors are important, but so are advocates along your front-lines. In fact, Google suggests that identifying 5-10% of your employee end-users as change champions is ideal. And of the companies strongly agreeing that change management did deliver against their objectives, 67% said that change champions played a key role. Unfortunately, many end-users aren’t naturally equipped for the role of change champions. That’s why you should look for a cloud migration firm that offers coaching programs specifically designed to help your champions understand the importance of these roles and to fulfill them more effectively. One mistake that many companies – and even change teams – make is to woo their champions, but ignore the naysayers. Negative feelings in your organization can run deep and be hard to pinpoint, and taking the time to do so is well worth the effort. We use our Transformation Labs to provide an important method for turning detractors into advocates before and after a launch. It helps them discover use case scenarios that get them excited about the new tools. Give those naysayers a voice in communications and trainings to sway these important influencers to your cause. Communication is the third phase in preparing for change. But since it’s also a continuous effort impacting every stage of a transition, we’ll address it more thoroughly in the following section. Don’t underestimate the power of marketing internally to your employees. Indeed, a huge portion of change management is ensuring that communications are extensive, frequent, prolonged, accurate, and entertaining. Once you decide on which communication channels make the most sense for you, the next step is to establish the actual configurations and messaging. A good change management program provides email templates for key communications. It also trains admins in each channel how to: set the channel up, invite appropriate users, plan and curate content, and interact with submitted questions and feedback. Your messaging plan should include procedures to update results, recognize successes, and praise collaborative efforts. As for content, one lesson learned from experience is you need to clearly communicate the reasons for the change in the first place. A surprising 48% of companies reported that even with a change management program, the reason for the change was not communicated effectively. This is one of the easiest ways to achieve employee buy-in, and almost half of the change management programs surveyed were dropping the ball. What are those reasons for change? We covered many of them in the Introduction and the section on the benefits of cloud migration. Each company will have its own individual reasons (such as new market positioning and competitive forces, for example), and these should be shared to put the program on a more personal level.Whatever those most compelling reasons for change are, your employees will want to know. Make sure you communicate those reasons strongly in your plan. The other aim of a communication plan is to maintain enthusiasm and make the transition fun. Carry a budget for splashy displays, funny videos, contests, food, and celebrations. Cultivate a positive view of the process and you’ll be rewarded with more engagement, higher adoption rates, and overall better results. While all the preparation, planning and communication strategies we’ve talked about are akin to the brains of a change management process, training is the heart. How smooth your transition goes has everything to do with how well you train your employees. This training can take a variety of forms: informal, self-paced learning, remote instructor-led training, or in-person classroom. Of these, self-paced learning is the most popular, with 83% of companies reporting it as their primary means. It’s interesting to note, however, that companies with robust change management programs utilized remote instructor-led sessions more (75%). They also used classroom instruction far more (45%) than those companies with light or no change management programs (7%). The best training plans, of course, offer a mix of these training styles. That’s the Cloudbakers approach. Cloudbakers offers a comprehensive list of ready-to-go training modules. We start by determining if users need basic introductory training or more in-depth walkthroughs. We recommend using our highly skilled professionals to conduct these trainings, although we sometimes offer train-the-trainer engagements, too. Good training anticipates the questions your people will have. That’s why we enlist some users to start playing with the systems well before deployment. We want to hear those questions, get their feedback – and find out which trainings would be most useful for their groups. Then we develop a training plan specific to your employees, taking all this information into account. We want to know which trainings (and their sequencings) need to be conducted prior to deployment. What will users need to know on Day 1? What trainings will help familiarize them with the new systems enough to minimize productivity losses and security risks during your transition? A user adoption approach to training also ensures more participation. In their study, Google found that training participation rates were all the way down to 22% without change management...but with an excellent change management program, the participation rate rose all the way up to 40%. Identify “naysayers” – you know, the folks who resist change. Build a use case for them that will get them excited. One example could be the C-Suite’s executive assistants and helping them prep for board meetings (always a tense, challenging situation). These opportunities are golden — win them over, you win everyone over. Hold periodic ‘Transformation Labs’ with specific departments in order to create better processes around the tasks you’re still doing the old way. The main points through this phase are to continue your excitement and momentum beyond launch, to push for better adoption and usage results, and to support the new systems by answering questions and offering additional training as needed. There are many more benefits. Of course – these are just the ones that directly impact your bottom-line. We’ve also shown that not all change management programs are created equal. If you want the best results from an “excellent” program, you need to work with industry leaders such as Cloudbakers. Your Change Management Program can be customized and “tailor-made” to your organization! Excellence in change management is a Cloudbakers specialty. With our exclusive change management solutions, you’ll enjoy all the benefits of cloud computing... while minimizing your risks. So if you’re ready to lift your company into the cloud, the next step is simple: take advantage of Cloudbakers’ complementary Best Practices Review. If you would like a downloadable version of this post to share with your team, please download here.